Lysine is an essential amino acid that plays an active role in growth and development, collagen formation, calcium absorption and cholesterol regulation. Arginine is a conditionally essential amino acid involved in wound healing, immune system function and hormone secretion. Both are widely available in food and generally occur together. Eating foods that are high in lysine and relatively low in arginine may help prevent outbreaks of the herpes simplex virus -- arginine helps the virus replicate, while lysine counteracts the effects of arginine. 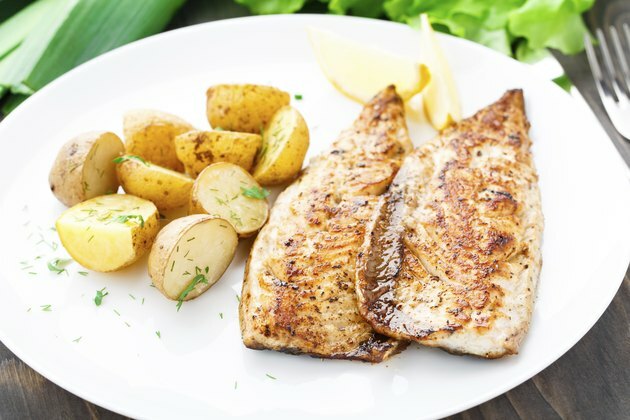 Fish is a top source of lysine. While some varieties do contain a fair amount of arginine, arginine levels in fish tend to be significantly lower than lysine levels. Coho salmon supplies close to 3.2 grams of lysine and just over 2 grams of arginine per 5-ounce portion, which makes it about 35 percent higher in lysine than arginine. A cup of canned light tuna has about 3.9 grams of lysine and 2.5 grams of arginine, which is the same lysine-to-arginine ratio as salmon. Yellowfin tuna, halibut, mackerel, herring and trout contain similar ratios. Shrimp, clams, oysters and other kinds of seafood are generally higher in arginine, however. Although dairy products don’t generally pack as much lysine per serving as other animal sources, their lysine-to-arginine ratio tends to be greater. According to the U.S. Department of Agriculture, a 6-ounce serving of high-protein, low-fat yogurt supplies about 0.75 gram of lysine and 0.25 gram of arginine, or three times as much lysine as arginine. Milk contains about the same ratio -- reduced-fat and nonfat varieties both provide around 0.7 gram of lysine and 0.24 gram of arginine per cup. Cheese is another good option, as most varieties -- including provolone, Swiss, Parmesan, mozzarella, cheddar and cottage cheese -- are roughly 50 to 70 percent higher in lysine than arginine. Poultry, beef and pork are usually good sources of lysine. With 5.3 grams of lysine and 3.2 grams of arginine per a 6-ounce serving, roasted turkey breast is about 40 percent higher in lysine than arginine. A skinless roasted chicken breast provides about 3.7 grams of lysine and 2.6 grams of arginine per cup of chopped meat, making it only slightly lower in available lysine than turkey. Top-sirloin and rib-eye beef steaks supply about 4 grams of lysine and 2.8 grams of arginine per 4-ounce serving, while pork chops deliver similar amounts. Processed meats tend to have a lower lysine-to-arginine ratio -- beef hot dogs and turkey cold cuts are only about 20 percent higher in lysine than arginine. Beans, peas and lentils are among the most important vegan sources of lysine, but most varieties are actually higher in arginine and therefore more likely to promote replication of the herpes virus. Any food that contains more lysine than arginine can be helpful, but those with the highest lysine-to-arginine ratio are generally more beneficial. Although boosting lysine intake while consuming less arginine hasn’t been conclusively shown to prevent outbreaks, the therapeutic dose of lysine for herpes infections -- or the amount typically given in supplemental form to protect against outbreaks -- is 3 grams per day, according to NYU Langone Medical Center. A diet that includes plenty of fish, low-fat dairy products, turkey, chicken and lean cuts of beef could easily achieve this level, even when arginine is accounted for. Berkeley Wellness Center: Lysine for Cold Sores? How Much L-Arginine Is Found in Nuts?